As we take thanks for our troops this weekend, you will also be able to celebrate the seasonal weather we have in store for us this week. Certainly no mention of any sort of record material this week, but if you’re going to the North Florida Fair at the north Florida fairgrounds in Tallahassee you might be able to set a few personal records for rides and games before the fair wraps up on November 12th. There is no threat of rain for the rest of the fair, and weather across Florida will be normal for this time of year. In fact, the only threat of rain this week will come Tuesday morning from a weakening cold front that will push through the panhandle while you sleep. The front will fall apart across south Florida late in the day on Wednesday with just a few showers remaining. 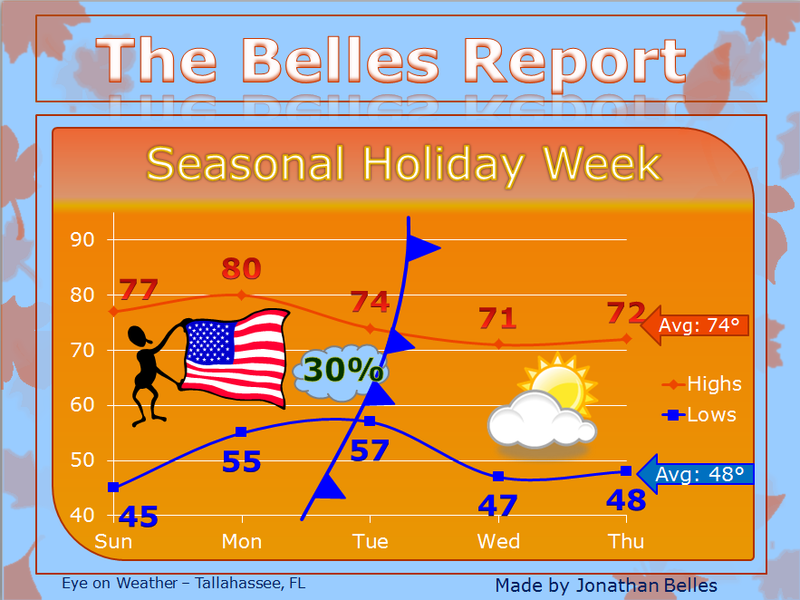 Temperatures will not fall as much as they did last week, but they will still tumble after the front pushes through. I do not think anyone in Florida will see 30s with this go around, and I think even the cooler spots will stay in the low to mid 40s for lows. Low 80s will be prevalent before the front, and in the 70s around the sunshine state afterwards. I want to send a special shout out to all of the men and women in uniform this weekend, in the recent past, and in spirit for defending this great nation, taking chunks of their lives to defeat the bad in the world, and for getting our country back in order after natural disasters like Sandy. An extra special shout out to my father and sister this weekend for everything they have done and all that they have had to deal with in the recent decades in the Army and Army National Guard! Thank you! Posted on Saturday, November 10th, 2012, in Florida Weather. Bookmark the permalink. Leave a comment.